Senior Haley Stephenson is on her way to success for this year and the next. As of right now, Haley really enjoys being apart of The Bell staff as well as the school’s broadcast, KLHS. “I have met so many amazing people that I never would have met otherwise,” Stephenson said. Haley also stated that her four years of dedication were amazing because of those amazing people she got to meet. For next year, Stephenson plans to attend Maple Woods Community College. 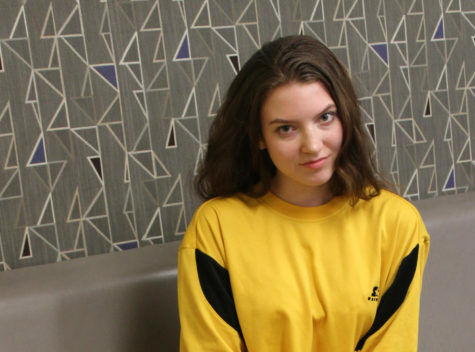 “I am passionate about fashion and textiles, as well as business and writing so I’m going to use my time in community college to reflect inwards and figure out what I want to do with my life,” Stephenson said. In her future, Haley would love to travel to Amsterdam because she once read that it was the happiest place to live. For the freshmen of 2018, Haley’s advice would be to reflect on who you are and who you want to be. She states that your four years of high school are going to hold immense changes for you and everyone around you. “You will have many good days and tons of bad days that will beat you to the ground and make you forget why you’re here, but it’s up to you to make every day count towards the bigger picture,” Stephenson said. Stephenson wants to live her life by a quote made by one of the most famous rappers out there. With her wise advice and strategic plan for the future, Stephenson is surely destined for success.